This tab enables you to create and organize business components into business process tests and flows, and flows into business process tests. The Test Script tab has a grid view and a canvas view. In the Test Plan tree, select a business process test or flow and click the Test Script tab. For user interface details on the Test Script tab when the selected test is not a business process test or flow, see the Micro Focus Application Lifecycle Management User Guide: Test Script Tab. In addition to manually adding existing business components to a flow or business process test, you can create a flow or business process test comprising components created automatically by recording your operations as you navigate a packaged app. For details, see How to Learn Flows and Business Process Tests. You can group components in a flow as you would in a business process test. However, it is recommended that you do not group components in a flow for compatibility with future versions of BPT Packaged Apps Kit. Caution: If you are using dynamic data and are working with an external data table in Microsoft Excel to change parameter values and add iterations, the information listed in the Test Script Tab is not accurate. To know how your test will actually run, see the data defined in the Excel file. Select Components. Opens the Select Components and Flows Pane, enabling you to add content to your flow or business process test. For user interface details, see Select Components and Flows Pane. Record Steps. Enables you to record components automatically by navigating any application. For task details, see How to Record Components into Flows and Business Process Tests. Available when:A flow or business process test is selected. You must have the correct permissions to record, For details on the permissions needed to record, see Prerequisites, or see the Micro Focus Application Lifecycle Management Administrator Guide: Managing User Groups and Permissions. Learn Flow. Enables you to learn a flow automatically by navigating your packaged app. For task details, see How to Learn Flows and Business Process Tests. Available for: BPT Packaged Apps Kit users with a flow selected. BPT Packaged Apps Kitmust be enabled for the current project. Access to BPT Packaged Apps Kitmust be provided by your Application Lifecycle Management (ALM) Project Administrator using Project Customization. For details, see the Micro Focus Application Lifecycle Management Administrator Guide: Business Process Test Page. You must have the correct permissions to learn a flow, For details on the permissions needed to learn a flow, see Prerequisites, or see the Micro Focus Application Lifecycle Management Administrator Guide: Managing User Groups and Permissions. Canvas/Grid View. Toggles between the grid view and the canvas view. For user interface details on the grid view, see Grid View. For user interface details on the canvas view, see Canvas View. Enables you to expand all nodes in the view. Enables you to collapse all nodes in the view. New Component Request. Enables you to request a new business component. For task details on generating a request for a new component, see the step How to Create Business Process Tests and Flows. Move up/down. Enables you to change the order of entities in the business process test by moving a selected component, group or flow up or down in the order. Tip: You can also change the testing order by dragging and dropping selected items. Delete from Test. Removes the selected business component, group, or flow from the business process test (or flow). If criteria are specified for a component that is about to be removed, a warning message is displayed. The component is still available for future use, if required, from the component tree. You can also change the testing order by dragging and dropping selected items. If you are deleting the last component in a group, the entire group is deleted. If the parameter is used at higher levels, automatic deletion does not delete it. If there are other unused parameters, not related to this delete operation, at the higher levels, automatic deletion does not delete them. For details on enabling automatic deletion, see the Micro Focus Application Lifecycle Management Administrator Guide: Enable automatic deletion of unused test/flow parameters when deleting a parameter at a lower level. Not available when: Attempting to remove a business component from a flow whose business process test is selected in the test plan tree. First, select the flow in the test plan tree, and then delete the business component. Go To Component/Flow. Goes to, and opens, the selected business component in the Business Components module or the flow in the Test Plan module. Group. Creates a group that includes the selected business components and/or flows. The components and flows must be contiguous. A component or flow can belong to one group only. A group node is created above the grouped items and is identified by the group icon . The group is named, by default, Group followed by a unique number. You can rename the group by right-clicking its name and selecting Rename. You can add other business components or flows to an existing group by dragging and dropping a component or flow from the component tree or the test script pane to the relevant position in the group. You can change the order of the members of the group by dragging and dropping. Ungroup. Ungroups components and/or flows. To completely remove a group, including its members, select the group and click the Remove from Test button in the toolbar. To remove a business component or flow from a group, select the component or flow. Drag the item up or down out of the group, and drop it at the required location. Add New Branch. Adds a new branch to a test or a flow. For details, see How to Add Branches. Add Branch Option. Defines options for a branch. Show Test Parameters Promotion Status. Enables you to view a list of test and flow parameters that were promoted and where they were originally defined. For user interface details, see Test/Flow Parameters Promotion Status Dialog Box. Refresh. Updates the data, such as the component parameter data and snapshot, for each business component in the business process test. The test itself is not updated. Validate. Checks the business process test or flow and all the test instances within the test set for errors. For user interface details, see Test Validation Results Dialog Box. Edit Branch Condition. Opens the Branch Condition dialog box enabling you to edit branch conditions. Available when: A branch condition is selected. Edit Branch Option. Opens the Branch Option dialog box enabling you to edit branch options. Available when: A branch option is selected. Add/Edit Run Condition. Enables you to add run conditions to your flow or test. For user interface details, see Run Conditions Dialog Box. Available when: A business component or a flow is selected. Delete Run Condition. Enables you to remove an existing run condition from your flow or test. Available when: A flow or a business process test is selected. Run or Debug Test. Enables you to run or debug a business process test or flow. For user interface details, see Run or Debug Test Dialog Box. Open BPT/Flow. Enables you to launch BPT tests and flows in UFT. Note: Requires UFT 14.02 or later. Stop Run. Enables you to stop the current run or debug session. Available when: Running or debugging a test from the Test Plan module. Snapshot thumbnails, instead of an icon. Separate columns for input and output parameters, which include parameter names and if only one iteration, the value for the parameter. Links between input and output parameters, without having to open the I/O Parameters dialog box. For additional details, see Input Parameters and Output Parameters in the Grid View. Not available from: The canvas. Regular View. Enables you to switch back to the regular grid view from the extended view. Adjust Row Height. Adjusts the row size in extended view of the grid. This enables you to view all the text in the if the text is long. Available when: In grid view's extended view. Opens the iterations dialog box for the selected entity. For user interface details, see Iteration Pages. Hides or shows the tabs at the bottom of the Test Script tab. Opens a submenu with the Group and Ungroup options. Available from: <right-click menu>. If more than one component is selected, the Group option is available. If a group is selected, the Ungroup option is available. Expands/collapses the node for the selected entity. Opens the Details dialog box for the component, component request, or flow. Displays the description and comments of the business component, flow, or group in read-only format. Enables you to add an image of your application to an ALM record. Displays the manual steps defined for the component. Lists the parameters defined for the component or flow. Displays additional comments for the component instance. The grid view enables you to modify your test scripts in a table-like format. Snapshot icon, indicating that the business component or flow has a snapshot. Click the icon to see the snapshot. Available when: In the grid's regular view. Snapshot thumbnail. Click the thumbnail to see the snapshot. Available when: In the grid's extended view. Displays the name of the business component or flow. Note: If an entity is selected for the current test or flow multiple times, an instance notation is automatically appended to the name in this column. Displays the status of the business component or flow. Displays the number of input and output parameters defined for the business component or flow as a dynamic link, which opens the I/O Parameters dialog box. For user interface details, see I/O Parameters Dialog Box. Available when: Working in regular view, by clicking . Displays the name of any input parameters defined for the business component or flow as a dynamic link, which opens the I/O Parameters dialog box. For user interface details, see I/O Parameters Dialog Box. If only one iteration is defined, the parameter value is also displayed. Tip: As you add iterations, the parameter value disappears and only parameter names are displayed. If you remove iterations until only iteration is left, the parameter value for that iteration reappears. You cannot edit values directly in this column. Available when: Working in extended view, by clicking . Displays the name of any output parameters defined for the business component or flow as a dynamic link, which opens the I/O Parameters dialog box. For user interface details, see I/O Parameters Dialog Box. Displays the number of iterations defined for the business component, group, or flow, followed by the range of selected iterations. This information is displayed as a dynamic link, which opens the Iterations dialog box for the selected business component, flow, or group. For task details, see How to Set Data for Iterations. Displays a link to the run conditions defined for the business component or flow. Tip: If a run condition is not valid, the run condition link is displayed in red. This can happen, for example, if a reference parameter was deleted, a parameter value was encrypted, and so on. Delete the run condition and define a new one. Enables you to define whether a run continues or ends if a specific business component or flow in the test fails. Exit. The business process test run ends if the selected business component fails. Continue. The business process test will run the next business component or flow if the selected component fails. By default, this failure condition is defined for each component when it is added to a test. To set the default On Failure value, see the Micro Focus Application Lifecycle Management Administrator Guide: Set default On Failure behavior to. Displays the comments for the business component, group, or flow. The canvas view enables you to modify your test scripts using a graphical display. The canvas view includes all the functionality of the grid view. The canvas enables you to visualize the data flow in the test or flow, including parameters and links. The following describes how to work in the canvas view. Drag entities onto the canvas from the Select Components and Flows pane. For details on the Select Components and Flows pane, see Select Components and Flows Pane. Drag entities within the canvas to reorder them. Drag components into or out of groups. Double-click a component, component request, or flow node to view the details in a separate window. Note: You cannot edit component request details by double-clicking its node from a flow within a business process test. The component request opens in read-only mode. Double-click a group to expand or collapse it. Hold down the CTRL key and use the mouse wheel to zoom in and out. Zoom Out. Decreases the zoom level of the canvas. Tip: You can press and hold this button for quicker zooming. Zoom Level. Increases/decreases the zoom level of the canvas using a slider. Zoom In. Increases the zoom level of the canvas. Reset Zoom. Resets the zoom level to the default zoom settings. Show Minimap. Toggles the display of the overview in the canvas view. Located in the lower-left side of the canvas view, the overview is a reduced canvas of the currently-selected business process test or flow. The framed area of the overview is magnified in the canvas. Select an area in the overview to focus on the selected area in the canvas. Drag or resize the frame to change the focus of the model in the canvas. User defined is displayed if you manually change the detail level, such as by expanding or collapsing the parameter details for a few nodes. Start node. Represents the start of the business process test or flow. For display purposes only. Component node. Represents a component entity. Component Request node. Represents a component request entity. Group node. Represents a group entity. Click the expand and collapse buttons to show/hide components in the group. Click the group name to edit the name. You can drag and drop components into and out of groups. Flow node. Represents a flow entity. Tip: Click the expand and collapse buttons to show/hide components in the flow. Drop indicator. When selecting an entity from the Select Components and Flows pane into the canvas, or moving an entity within the canvas, this indicator helps you position the entity. 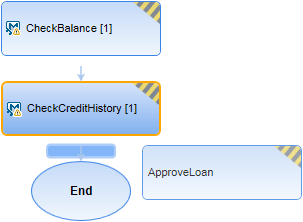 Example: The ApproveLoan component is being pasted after the CheckCreditHistory component. Status. Located at the upper right of an entity's node, indicates the status of the entity. A red triangle indicates that the entity (or one of its sub-entities) has an error. A striped triangle indicates that the entity (or one of its sub-entities) has a status of Maintenance, Under Development, or Not Implemented. Lack of a triangle indicates that the entity (and all of its sub-entities) is ready. Collapse. Hides nodes for the selected entity. Expand. Shows nodes for the selected entity. Entity Order. Indicates the order of the entities in the business process test or flow. Input parameters. Indicates the number of input parameters for the entity. Tip: Click to display a scrollable list of the entity's input parameters. Output parameters. Indicates the number of output parameters for the entity. Tip: Click to display a scrollable list of the entity's output parameters. Promotion/Linkage Arrow. Indicates from where parameters were promoted or to where parameters are linked. Note: When many links exist between parameters, click the triangle next to a parameter name to display that parameter's link in yellow. Tip: Hover over the arrow to see the name of the target node of the link. Instance. Indicates the instance of the entity in the test or flow, if the entity was selected multiple times. Iterations. Indicates the number of iterations selected for the entity in the test or flow. For example, if an entity has 5 iterations, but only iterations 3 and 4 are selected to run, this Iterations UI element will display 2. Click to open the Iterations dialog box for the entity. Hover over to see a tooltip that displays which iterations are selected. Tip: If the number of iterations is greater than 999, a K notation is used (for example, 3K is displayed if there are 3145 iterations. If the number of iterations is greater than 999,999, an M notation is used (for example, 1M is displayed if there are 1,334,452 iterations). For user interface details, see Iteration Pages. Exit. Indicates the component has an On Failure condition that is set to exit. Run condition. Indicates the component or flow has a run condition. Click to open the Run Condition dialog box. Hover over to see a tooltip that displays the run condition. Notification. Click to see the notification, such as (iterations mismatch). End node. Node representing the end of the business process test or flow. For display purposes only. This pane enables you to select business components and flows for inclusion in a business process test (or flow). ALM adds instances of the selected components or flows to the test (or flow). Displays the component tree, from which components can be added to flows and tests in the Test Script tab. Displays the flows tree, from which flows can be added to tests in the Test Script tab. Quick Add. Adds the selected business component or flow after the component, group or flow selected in the Test Script tab (or at the end of the test if no component or flow is selected). As the component or flow is added, parameters, if any exist, are promoted according to the last promotion method used. Add and Automatically Promote All Parameters. All parameters are promoted to the next level as the component or flow is added. Add without Promoting Parameters. Parameters are not promoted to the next level as the component or flow is added. Add while Setting Promote Options. The Promote Parameters dialog box opens, enabling you to individually set which parameters should be promoted. For user interface details, see Promote Parameters Dialog Box. For task details on promoting parameters, see How to Promote Parameters. Show Entity Details. Opens the Details dialog box for the selected entity in read-only mode. Go to Entity in Module Tree. Navigates to the selected entity's location in that entity's module, and highlights the entity. Find. Searches for a specific test in the tree. Type the name (or part of the name) of the test in the Find box and click Find. If the search is successful, the test is highlighted in the tree. For details, see Micro Focus Application Lifecycle Management User Guide: Find Dialog Box. Filter/Sort. Filters and sorts the test in the tree. For details, see Micro Focus Application Lifecycle Management User Guide: Filter Dialog Box. Go to Component/Test by ID. Opens the Go To Component/Test dialog box, enabling you to find a specific component by component ID of a flow by test ID. Note: You can only go to components or flows that are in the current filter. Close. Hides the Select Components and Flows pane.